PRIME is our newest cotton wicking material and was developed specifically with RTAs, RDTAs, and squonking in mind. PRIME uses a different strain of cotton that has naturally thicker fibers. These thicker fibers allow the cotton to absorb liquid at least 33% faster (seriously, we measured)! 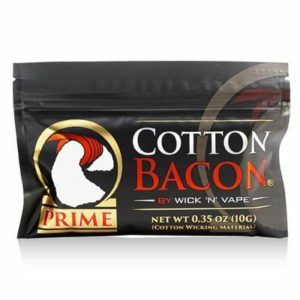 PRIME is still everything you love about Cotton Bacon V2, but with even faster wicking! That means no dry hits and no break in time. It’s tasteless, free of impurities, natural oils, and pesticides. Use it anywhere you’d use V2, and especially in a tank or squonk situation! Each bag of PRIME includes 10 strips of cotton and has a unique “Scratch and Reveal” product authentication sticker.